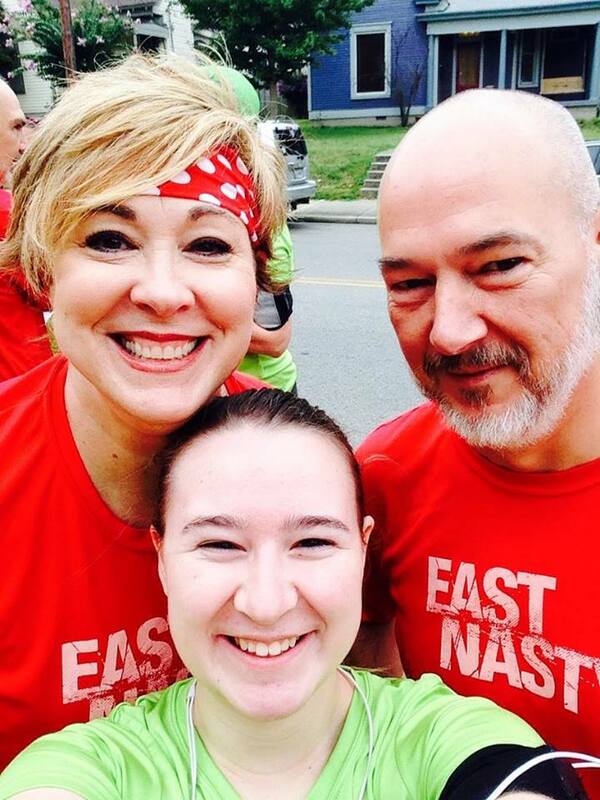 As an East Nasty runner and coach, husband to the amazing Joy Howard, and most recently, MARATHONER, our latest East Nasty of the Week (ENOW) needs no introduction. Kevin Howard was born in Indiana but grew up in the small Tennesse town of Cookeville. In high school, he was the shy band-geek who played no sports at all. However, he regrets he never went out for track in high school. After his stint as high school band geek, Kevin studied English/Journalism at Tennessee Tech. While there, he discovered fraternity life but, miraculously, still managed to get a degree. Graduation day, he moved to Nashville and hasn’t looked back. Kevin is now a Realtor with Keller Williams. He works all over Davidson County but concentrates in East Nashville. Although it may not seem like it, Kevin wasn’t always such an avid runner. He ran a couple of 5Ks in the 90s, but marriage, buying a house to renovate, and starting a family kicked running and most of his other hobbies to the curb . . . until a couple of years ago when he caught the running fever and the only cure was East Nasty. Speaking of East Nasty — just how did Kevin get involved in our group? His wife, Joy Howard, took up a challenge that Kristine Mylls proposed to their book group to join in on a couch to 5K program (And here I thought book club was all about the wine). From there, Joy started coaching the C25K group and pulled their daughter, Emma, into the program in 2012. In 2013, Emma and Kevin both signed up, and that’s when running became a family affair. Bonding with “Group 4” of that training session gave him the incentive to venture from 5ks to 5 miles and eventually to train for Country Music Half. So, in a little under a year, sticking with the East Nasty training programs, he went from zero to 13.1, found an incredible training group, and formed some fantastic friendships. 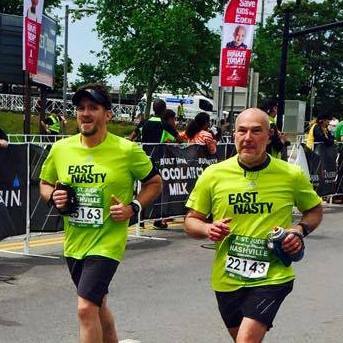 Propelled by peer pressure, Kevin and his “Group 4” ran the NOLA Half Marathon, and, on a bet, he and fellow East Nasty Jeremy Taylor committed to running their first full marathon. AH, peer pressure and bets — the stuff running dreams are made of. In case you can’t tell, Kevin’s a social runner (and apparently easily persuaded by peer pressure). By far, the most enjoyable thing about East Nasty for him is the camaraderie and support that running with the Nasties provides, regardless of ability, fitness level, age, or zip code. The community support aspect of the Nasties is the icing on the cake. As for Kevin’s greatest running accomplishment — that’s easy! It’s finishing the Country Music Marathon a few days after his 54th birthday. However, he says it’s about more than crossing the finish line; it’s about the journey. I’d say it’s about the post-race beers, but the journey’s pretty memorable too, Kevin! As with most of us, it was hard for Kevin to choose just one memorable East Nasty experience. Being the occasional rule breaker that I am (I may have crossed the street outside of a crosswalk once or twice on an East Nasty run — sorry, Duane! ), I allowed him TWO of his favorite moments. 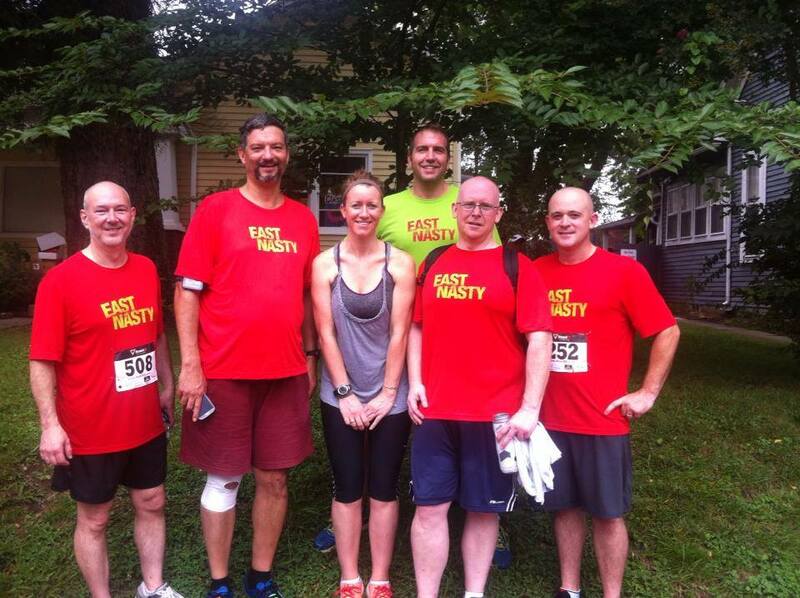 The first was finishing the Tomato Fest 5K last year with the first group of new runners he had the privilege to coach over the summer, running with them as they crossed the finish line, and seeing many of them continue on and do the CMM half this year. 2014 P2T Group: First experience coaching a P2T group with an amazing group of women, lead by Bree Roy and Rula. The second has to be running with Jeremy Taylor up Woodland during the CMM this year, their first marathon. 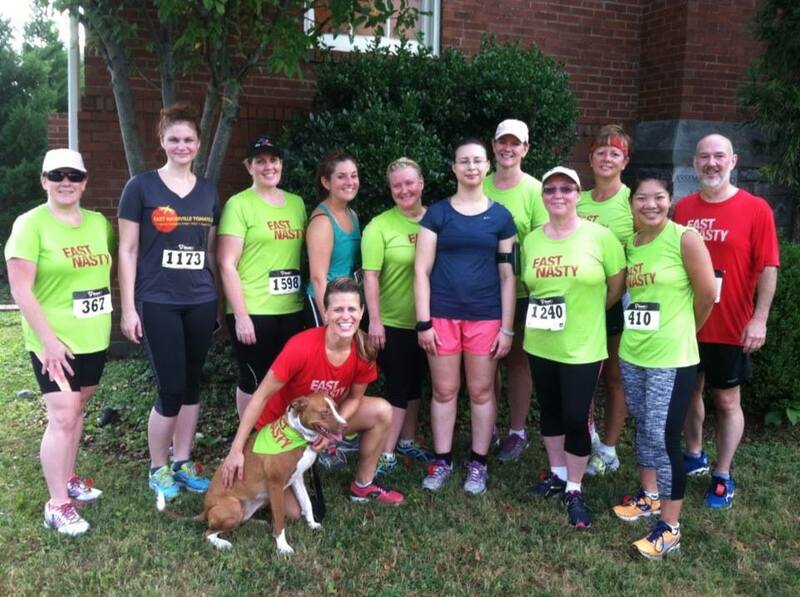 They didn’t feel like there was any way in the world they could finish until familiar East Nasty faces started appearing to provide support at the Nashville Running Company water stop. 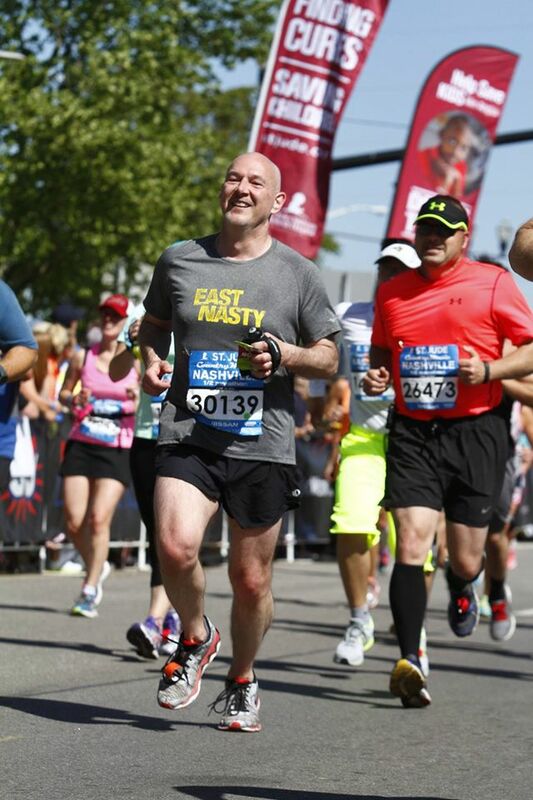 Kevin says they didn’t run across the finish line — the East Nasty running family pulled them across. He’ll never forget how that support and encouragement felt. Full Finish: Finishing the CMM this year with Jeremy Taylor. At least the blurry picture hides the tears. Besides running, Kevin doesn’t have much time for other hobbies. Between family activities, the insane Nashville housing market, their fixer-upper that’s still being fixed up, and long training runs, he’s all booked up. I asked Kevin’s wife, Joy, to say a few things about him. “There are many things I could say about Kevin, but what stands out to me the most is that he realized that East Nasty is much more than running. It’s about building relationships and finding your tribe. Running is what brings everyone together, but relationships bring us back.” Seems like the perfect summation of what this group is all about! Congratulations, Kevin! You truly embody the drive, determination, and spirit that is East Nasty! This entry was posted on Monday, May 11th, 2015 at 8:01 AM and is filed under East Nasty of the Week. You can follow any responses to this entry through the RSS 2.0 feed. You can leave a response, or trackback from your own site. Congrats Kevin. Just goes to show how far hard work and a good attitude — plus a great wife and awesome training partner — can take you (at least 26.2 miles).